Have some FLV videos on your pc local hard drive that you want to play on your Samsung TV by copying them to a USB drive and then connecting it to the TV, but your Samsung TV not read the FLV files. You may assume that you need to convert to a different format, but you have no idea which format settings work best with your Samsung TV. Why Samsung TV not play FLV files? From Samsung TV’s official page, we find that FLV container is included in Samsung TV supported file formats. However, the FLV format should be encoded with Samsung TV compatible codec, resolution, frame rate and bit rate listed in the following tablets. If not, you will either fail to open FLV files on Samsung TV or suffer other playback issues with FLV files on Samsung TV. To get a successful and smooth playback of FLV files on Samsung TV, we highly recommend you to convert FLV to Samsung TV most favorable playback format, container, video codec, resolution, frame rate and bit rate listed above. Here, you can get the job easily done with our powerful yet simple to use FLV to Samsung TV Video Converter – Pavtube Video Converter, which can fulfill your great demands to produce the best results for you. If you own a Samsung 4K TV, it would be ideal for you to encode FLV to either H.264 High Profile Codec or H.265 codec. For Samsung HD TV owners, there are many codec choice for you such as Divx, Windows Media Video, MPEG-1, MPEG-2, etc. You can then adjust to produce Samsung 4K TV or HD TV best compatible playback settings in the program’s “Profile Settings” window. 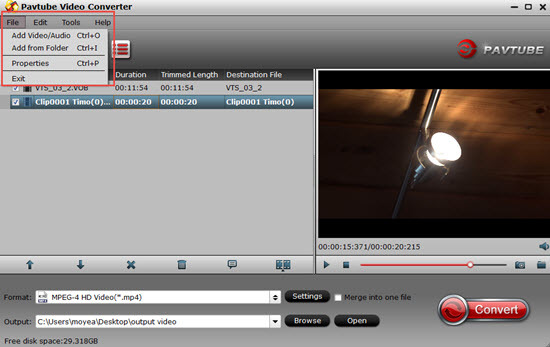 Tips: Pavtube Video Converter supports hard-ware acceleration technology. You can get up to 6x H.264 codec encoding speed if your computer runs on Graphic cards that supports Nvidia CUDA or AMD App technology, 30x H.265 codec encoding speed if your computer runs on Graphic card that supports Nvidia NVENC technology. 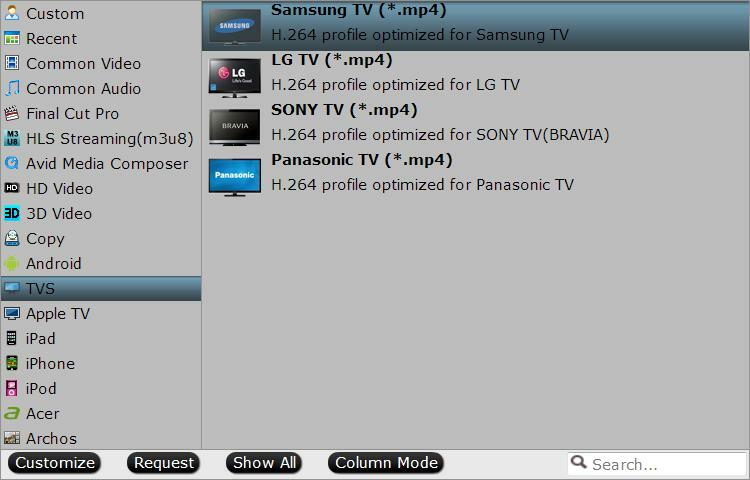 For those people who have no ideal how to adjust those settings on your own, feel free to use our program to directly output FLV to Samsung TV preset profile formats with the optimal playback settings for directly viewing on Samsung TV. For Mac users, please switch to download Pavtube Video Converter for Mac to perform the conversion on macOS High Sierra, macOS Sierra, Mac OS X El Capitan, Mac OS X Yosemite or Mac OS X Mavericks. Step 1: Load FLV files into the program. Download the free trial version of the program. Launch it on your computer. Click “File” menu and select “Add Video/Audio” or click the “Add Video” button on the top tool bar to import source FLV video files into the program. Clicking the Format bar, from its drop-down list, select to output Samsung 4K TV supported H.264 High Profile video or H.265 video, Samsung HD TV supported Divx, Windows Media Video, MPEG-1, MPEG-2, then click “Settings” to open “Profile Settings” window to produce Samsung 4K TV or HD TV best compatible playback settings. If you have no ideal how to change those settings on your own, feel free to directly produce Samsung TV preset profile formats “Samsung TV(*.mp4)” under “TVs” main category. After all setting is completed, hit the “Convert” button at the right bottom of the main interface to begin to convert FLV to Samsung TV compatible file formats or preset profile formats.